Outside the state of Oregon, Chip Kelly naming Marcus Mariota starting quarterback barely caused a ripple. 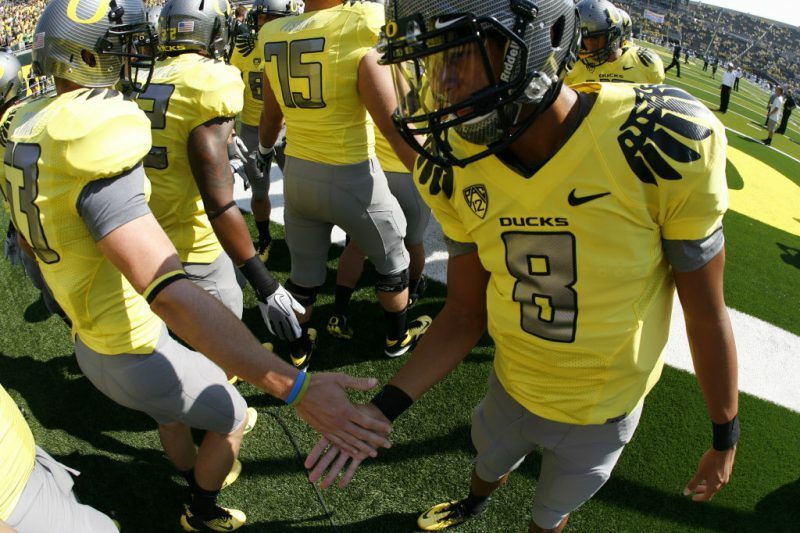 It made a clear announcement, however–Oregon is finally going to be a two-headed monster on offense. Mariota, the purer passer of the two quarterbacks vying for the starting position, won the job by his decision making, accuracy and cool demeanor. The coaching staff has made it apparent that they want to throw more by electing Marcus to run the team, and with the lack of proven depth at running back, no argument can be made against their decision. Assuming, of course, that the receivers take a giant leap from last year. After the decision was announced on Friday, the rest of the team’s depth chart was released as well, and it raised a few eyebrows; as Josh Huff, Keanon Lowe and Daryle Hawkins (a converted quarterback) were named the starters for Saturday’s season opener against Arkansas State. While Huff has shown glimpses of greatness in his first two seasons, albeit suffering through a leg injury all last season, Hawkins and Lowe have been primarily used in mop-up duty during blowouts. For the last 18 months, fans have been waiting in great anticipation to see the trio of talented redshirt freshman (B.J. Kelley, Tacoi Sumler and Devon Blackmon) take the offense to a whole different level, conjuring up memories of great receivers of the past. So far, that dream is beginning to fizzle. Early on in fall camp, Tacoi Sumler left the school, citing a desire for playing time and home sickness. Devon Blackmon has been completely unheard from, which begs the assumption that his grasp of the offense is not where it needs to be. Kelley, the fastest of the three and an anchor for Oregon’s track team, is the only one to crack the two-deep. With all due respect to Lowe, the former Jesuit High star, and Hawkins, who spent his freshman season as the third string quarterback, Oregon needs more. With 15 scholarship receivers on the squad, including another touted group of freshmen that made a splash in camp (including Bralon Addison, who also made the two-deep), the coaching staff should be able to find 4-5 guys that they can consistently count on. The receivers, who under Chip Kelly have been asked to do more downfield blocking than receiving, have an opportunity with Mariota under center to finally become the stars of this team. We all know what Josh Huff can do, and what DeAnthony Thomas will do. After that? It’s a mystery. In any spread offense, be it Mike Leach’s air-raid or Dana Holgorsen’s run-and-shoot style, the receivers are vital, and need to be in order to succeed. Under Kelly, technique and statistical sacrifice have been the name of the game. Now, that’s going to change, and change in a hurry. The talent is there for Wide Receivers Coach Scott Frost to sift through. A group that is littered with 4-star recruits should not have trouble finding speed to put on the field. Consistency, however, has been the missing ingredient in the passing game, be it dropped balls by receivers or inaccuracy from the quarterbacks. With Mariota under center, the hope is that the latter problem should be fixed. Last year, the best options in the passing game were tight end David Paulson, now with the Pittsburgh Steelers, and De’Anthony Thomas, who is most effective when splitting time between running back and receiver. Realistically, Oregon needs 2-3 receivers with break-away ability to be on the field at all times. Keeping the defense honest and not letting them crowd the line of scrimmage will be vital this season, as the Ducks look to replace perhaps the best player in school history, do-it-all running back LaMichael James. LaMichael, now with the 49ers, had an innate ability to slither through traffic unlike any other player we’ve see, rendering moot the opponents lack of respect for the receivers. Kenjon Barner, set to replace James as the main ball carrier, relies more on pure speed than anything, and will need solid targets on the outside to draw attention away. Despite the lack of big names popping up on the depth chart, there is reason for optimism. Bralon Addison, the do-it-all true freshman, has been the talk of fall camp, as he has been compared to De’Anthony in his ability to avoid tacklers and create plays. While lacking blazing speed, his football IQ, loose hips and tackle-breaking abilities have vaulted him into the discussion as perhaps the breakout player this group needs. Dwayne Stanford, another true freshman, has also been getting attention from the coaching staff, being called out as a potentially dominating red-zone target (he stands a shade over 6′-5″, the same build as departed Rose Bowl MVP Lavasier Tuinei.) Other players, such as the aforementioned Devon Blackmon and B.J. Kelley have the tools to be successful, assuming they put it all together. Also, the tight ends, especially true freshman Pharaoh Brown, have been receiving rave reviews from the coaches and players alike, potentially adding another weapon to Mariota’s arsenal. 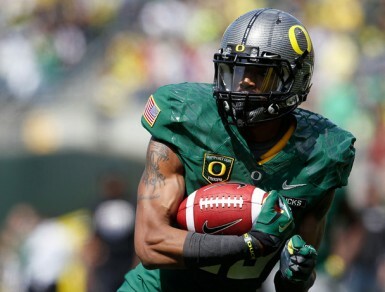 Make no mistake, Oregon’s offense will still live and die with the running game. But, with a quarterback under center who has “special” written all over him, this is going to be a different Oregon team than what has been seen since Dennis Dixon was running the show. Assuming Josh Huff returns to his freshman year form, and DAT remains healthy, the Ducks stand a dynamic receiver or two away from having the most complete, dangerous offense in the country. The time for the receivers to step up is now. And, finally, the ball will be coming their way consistently.